I trust your week is off to a fast start and that you had a great weekend! I spent mine enjoying six 11U Titans baseball games in Olathe and Shawnee. My son and I saw lots of K-State Alumni Association license plates, purple and Powercats as we drove around the greater K.C. area. We are always grateful for our fans showing the pride and wearing the purple proudly! Speaking of baseball, Coach Hill's charges did a great job of finishing the regular season strong – winning four out of their last six Big 12 games – over KU and at Texas Tech – to play their way into the conference tournament for the sixth straight year. Congratulations to Joe Flattery for throwing K-State's first complete game since A.J. Morris shut down Rice in the 2009 NCAA Tournament. Click here for ticket information for the tournament, including our opening-round matchup with Baylor at 12:30 p.m. today. Thinking back to 2009 reminds me that on Monday's date of that year I was returning from my first Big 12 meetings in Colorado Springs, to which I had traveled immediately after being introduced as your athletics director on May 18. Certainly that meeting was very interesting, but it would have been hard for most to anticipate the roller coaster of conference realignment we were about to endure for the following three years! Friday's joint announcement about the Champions Bowl with the Southeastern Conference is another tremendous step forward for K-State and the Big 12 Conference. Click here for the official announcement along with an informative questions/answers sheet, in case you missed it, but essentially the Big 12 and SEC have agreed to a five-year commitment for their football champions to meet in a New Year's night postseason bowl game beginning with the 2014 season. In years when a league champion is selected for the BCS play-off series (assuming we are about to switch to a four-team model), the next highest team would participate. So for instance, if this game and system had been in place last season, Alabama, LSU and Oklahoma State may have been in the play-off series and guess what – the SEC/Big 12 bowl would have featured K-State against Arkansas. As you will recall our AT&T Cotton Bowl match-up was one of only three that featured two top-10 teams. The new Big12/SEC agreement will help ensure a great matchup every year between the two conferences which have led college football in the BCS era. While many details around the agreement and the BCS playoff system are still to be finalized, this announcement is yet another validation of the Big 12's trajectory as a leadership conference in college athletics. I am grateful for the leadership of Chuck Neinas and incoming Commissioner Bob Bowlsby, and President Schulz and the Big 12 Board of Directors for their commitment to the bright future of our league. Here is a good link of articles from around the country that Big 12 correspondent Wendell Barnhouse put together. The new Big 12-SEC announcement has prompted another round of conference realignment speculation. In the Big 12 we are well aware of how it feels to be on the perceived other side of this discussion as some around the country speculated negatively 10 months or two years ago regarding our future. However, instead of collapsing and giving up, the continuing members of the Big 12 stuck together and worked to focus on our similarities rather than our differences and now, we emerge as one of the anchor pillars of college athletics. During that time the K-State nation didn't just stand by helplessly! Just like the heritage of our great state, we've focused on our strengths and how we could help ourselves. The K-State Nation has come together over the last three years to advance our own national position too! Certainly the college athletics world will continue to evolve, and in an evolving world we must operate from a position of strength, and never cease working tirelessly to enhance our position! So when you've made the decision after a long day of work to drive two or three or more hours to be one of the people packing Bill Snyder Family Stadium to 98 percent capacity like we have over the last two years, you have made that commitment. When together through careful fiscal management and ticket sales and Ahearn Fund gifts of all sizes we've created a positive balance sheet that has enabled us to embark on $100 million in athletic facility construction, we've made that commitment. If you are a student who joins the fun in filling up our great courtside/sideline student seating sections and giving the Cats a nationally recognized and unquestioned home advantage, you are making that commitment. That commitment is to a model intercollegiate athletics program that continues to operate and WIN at the highest level of intercollegiate athletics. It’s a busy time and I'm a bit behind on my updates, so here is a quick recap of some important activities over the last nine days. First, congratulations to the 56 student-athletes who earned their K-State degrees recently. We must never forget that the primary element of a world-class student-athlete experience is to give our young people the support they need to complete their degree requirements and be successful. It was great to meet many family members of our graduates at our annual graduation reception, which included a terrific message from Arthur Ashe Jr. Award finalist Victor Ojeleye to his fellow classmates. Many of our track and field, rowing and baseball graduates were not able to attend the "regular" commencement so we held a very nice alternate graduation ceremony in Bramlage on Tuesday for those individuals and their families so they had the opportunity to walk across the stage and receive their diplomas. We are especially appreciative of the deans and faculty members who took the time to attend and participate in this special moment. Graduation weekend was certainly a very busy time in Manhattan and around the athletics complex with commencement, a three game baseball series against the Jayhawks and, of course, the Big 12 Outdoor Track and Field Championships at R.V. Christian Track Complex. I need to thank the many behind the scenes staff members who toiled long hours in order for these events to be successful – individuals such as Nick Pecenka, Terry Pittman, Frank Berg, Molly O’Hara and Michael Barton of our facilities staff who made sure Bramlage was in pristine shape for six commencement ceremonies in 36 hours and Brian Cordill, Beau Stuart, Jeremy Holaday and Cole Walker of our operations staff for their tremendous work in planning and executing the Big 12 Outdoor Track and Field Championships. We had countless compliments on the event and one Big 12 head coach even called it “the best outdoor track and field meet in the history of the Big 12.” Thanks to all of those who helped make the event a world-class experience for all Big 12 student-athletes and coaches. More than 3,000 people were at R.V. Christian for what turned out to be a very exciting track and field meet. Our student-athletes sent the purple-clad fans home happy with record performances, including Big 12 titles from Ryann Krais, heptathlon, Erik Kynard, high jump, and Kyle Wait, pole vault, as well as numerous personal-best performances and a fourth-place finish by our men’s team, its highest placing since 1997. Our coaches and student-athletes were thrilled with the turnout and appreciate your support. Congratulations to Smith Center native and former Wildcat Mark Simoneau who became just the second player in K-State history and first under Coach Snyder to be elected to the College Football Hall of Fame. We are so proud of Mark, and for him to be recognized in this fashion is a validation not just of his efforts but also of Coach Snyder's special place in college football history as well as a tribute to the passion and values of the entire state of Kansas. Click here for the full release on the National Football Foundation’s Hall of Fame Class of 2012. Ticket sales are certainly indicative of the excitement and anticipation for the 2012 football season. We are currently running about 3,500 season tickets ahead of same-date sales compared to last year and are approaching a record total. While we still have season tickets remaining and encourage fans to reserve their seats for all seven home games, single-game tickets go on sale June 6. Click here for all of our ticket options. And, for those interested in traveling to Big 12 road games this season, click here for official K-State Alumni Association travel packages which include our inaugural trip to West Virginia, Oct. 19-21. Last week we kicked off our annual tour visiting locally hosted and operated Catbacker Club events around the state and we will be coming to a town near you. Almost 2,000 loyal K-Staters packed events in Dodge City, Garden City, Scott City, Colby and Hays as well a Topeka golf event on Friday. I enjoyed visiting with many of our western Kansas fans Tuesday and Wednesday and was glad to catch the Topeka event Friday evening. Be sure to keep up with all 31 events, including recaps and photo galleries, here at www.AhearnFund.com. This weekend Petra Niedermayerova heads to the NCAA Tennis Championships in Athens, Ga., as she will be competing as an individual for the second straight year. Petra, who was just named an Academic All-District selection, has collected 22 wins this season. Good luck to the All-Big 12 performer this week! And good luck to the members of our track and field teams this weekend as they compete in the NCAA West Preliminaries in preparation for next month’s NCAA Outdoor Championships. We were saddened earlier this week with the news that Wildcat and basketball legend Bob Boozer passed away. I enjoyed getting to know Bob and appreciate all that he did for Kansas State University. He will be missed, and our thoughts and prayers continue to be with the Boozer family as we mourn his loss. Click here to read Mark Janssen’s latest story on Bob and his memories of his Wildcat days. I am grateful for the opportunity to be your athletics director. 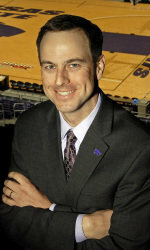 Thank you for all that you do to make K-State such a unique and wonderful place.